It'll be Chinese New Year in a few weeks and, to mark the occasion, Slotastic Casino will be introducing the new Fu Chi slot from Realtime Gaming this Wednesday. Then, until February 4th, they'll give you 50 free spins on the new Asian-themed game when you make a minimum deposit. A deposit bonus up to $555 will be available as well. Chinese New Year or "Spring Festival" is China’s biggest party of the year, is also known as the Lunar New Year. This year it begins February 16 and continues until the Lantern Festival on the 15th day of the New Year. To celebrate Chinese New Year, Slotastic is introducing a new Asian-themed slot game from Realtime Gaming. 2018 is the Year of the Dog. Those born in the Year of the Dog are said to be honest and loyal. Although they are sometimes not great communicators, they are considered helpful and have integrity. There is a 30x play-through requirement for these bonuses. There is no maximum cash-out. 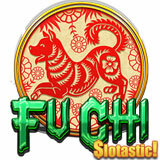 Slotastic will introduce two more Asian-themed games from RTG in February. Shanghai Nights will toast the riches and glamour of China’s most amazing metropolis and Fantasy Mission Force will be a tribute to the legendary Jackie Chan. Like all of its most popular games, Fu Chi, Shanghai Nights and Fantasy Mission Force will be available online in Slotastic’s download and instant play casinos and in the mobile casino for smartphones and tablets.